One would be forgiven for thinking that Nigerian terror group Boko Haram is now being tackled on several fronts and could soon be a spent force. Despite an attack on a village in Chad this weekend and an attempt to enter Gombe city, the capital of the Nigeria’s Gombe State, indications are that over 2 500 heavily armed Chadian soldiers are moving to encircle Boko Haram from the northern border between Nigeria and Niger, and the eastern front bordering Cameroon. Planning is also moving fast to establish the Multinational Joint Task Force (MNJTF). Set up by the African Union (AU) at its January summit in Addis Ababa, the force comprises up to 8 700 troops from the region. 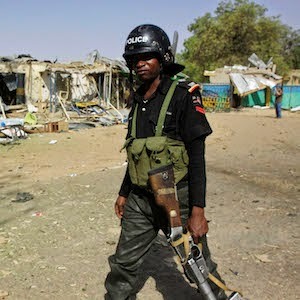 Besides, the government of Nigeria says that within a few weeks, before the elections that were moved to 28 March, security will improve significantly in north-eastern Nigeria. The military asked for the elections to be postponed from 14 February so that they could instead focus on curbing the advance of the murderous sect on towns across three states and in neighbouring Niger and Cameroon. Unfortunately it doesn’t seem to be all that simple. Researchers say Boko Haram might have thousands more fighters than estimated by intelligence services. Their pockets are lined with cash, thanks to bank robberies and looting in the towns that fall under their control. They also have a supply of arms stolen from the Nigerian military, and some that come all the way from Libya through the Sahel, reportedly linked to other radical armed groups. Long-term research on radicalisation and armed Islamist groups across Africa shows that deep-seated grievances linked to ethnic and religious marginalisation form an important push factor that drives young militants to join terror groups. Harsh treatment by the security forces, including torture and extrajudicial killings, further motivates those eager to take revenge on Africa’s militaries, who have proven largely inept at dealing with this kind of threat. At a seminar held at the Institute for Security Studies (ISS) in Pretoria last week, senior researcher Martin Ewi said estimates by foreign intelligence services that Boko Haram has only around 6 000 fighters seem far too conservative. According to Ewi, it could be closer to 20 000, and he estimates that around 4 000 Boko Haram combatants have been killed since the beginning of last year. ‘If so many have been killed, my estimate would be that their numbers are way more than 6 000,’ he said. At the time of the founding of Boko Haram in 2002 under charismatic leader Mohammed Yusuf, the group had 250 000 paid-up members. The movement was advocating the imposition of strict sharia law in northern Nigeria, but had not yet become a heavily armed terror group planting bombs, kidnapping civilians and carrying out suicide attacks as it. ‘It went from humble beginnings to an uncontrollable monster,’ Ewi said. Ewi is sceptical of the Nigerian government’s claims that the situation can improve substantially within the next five weeks before the elections. If it were planning, for example, to negotiate the release of the more than 200 girls from Chibok still held by Boko Haram, this would be a very difficult task. ‘The government will be hoping that the military will come home with some result, but I don’t think this will happen unless the government releases some of the militants, which is what they [Boko Haram] want,’ says Ewi. African diplomats attending the seminar welcomed the united stance of African countries and the decisive action by the AU to combat Boko Haram. ‘We are lucky that the AU has taken such a strong position,’ said a diplomat from Algeria. ‘In many regions of the world countries are divided over what to do and this facilitates terrorism,’ he added. Boko Haram’s reported attempts to establish a Muslim caliphate in northern Nigeria have been equated with the aims of the Islamic State (ISIS) in Syria and Iraq, against whom the international community is at pains to provide a united response. Ewi, however, says there are still many grey areas concerning the MNJTF, particularly about its scope and mandate. Following a meeting in Yaoundé, Cameroon, the AU has set up a small committee to draft a proposal to the United Nations (UN) Security Council for funding the force. Ewi further believes the terrain in which Boko Haram is operating is too vast for the regional troops, and suggests other African nations should perhaps also contribute to fighting Boko Haram. ‘We have a lot of experience in Africa in dealing with terrorism, including from countries like Algeria.’ Ewi also remarked that support from France, which has a substantial presence in N’Djamena thanks to its anti-terror Operation Barkhane, is crucial to the region’s fight against Boko Haram. ‘If France turns its back, the multinational force is going to fall apart,’ he says. Anneli Botha, a senior researcher at the ISS, said for the fight against Boko Haram to be successful it is crucial that perpetrators be arrested and prosecuted. If not, the vicious cycle of reprisals will merely continue. Seeking out those guilty of grave crimes requires intelligence and cooperation with local communities. In this regard, the police is much more adept than the military, since they have been trained in anti-terrorism strategies. ‘The military does have a role to play to establish an immediate sense of security, but it must be with a limited mandate. Intelligence is key to identify, arrest and bring to justice those responsible. Victims want to see justice done and this won’t happen by eliminating people,’ she says. Botha’s research in Kenya and Somalia has shown that respondents join groups like al-Shabaab mainly for personal reasons linked to their ethnic and religious identity, as well as political frustration. ‘Socio-economic circumstances are not the main driver of radicalism, so there is a disconnect from what we hear from politicians and what we see in the research,’ she said. The final catalyst that drives people to join terror groups is often linked to an overreaction by security forces. ‘Respondents would say they joined because “my imam was killed” or “the government hates Islam”. Sometimes the respondent or someone from his inner circle was arrested for no apparent reason due to ethnic or religious profiling,’ she says. ‘This shows us that the way the state deals with terrorism is very important. There are very worrying trends in security forces such as corruption, the use of torture and the disappearance of suspects’.